Spiral - "Architect for Humanity"
Honoring the Designs of Sacred Architect Robert Guillic. 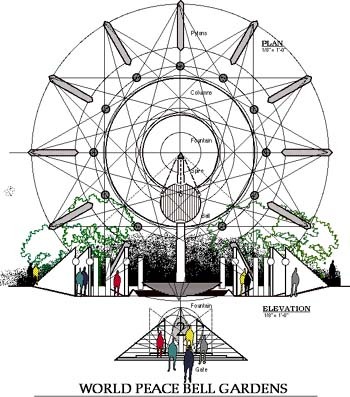 In 1987, Robert was asked to design some prototypical Peace Bell Garden Sites around a resonating structure. Since then he has presented us with the following concepts. World Peace Bell Gardens would like to especially acknowledge Mr. Guillic as truly representing what we call an "Architect for Humanity". Presently, we are soliciting and looking at possible locations for their placement.